I’m back with another great series by David Eddings. 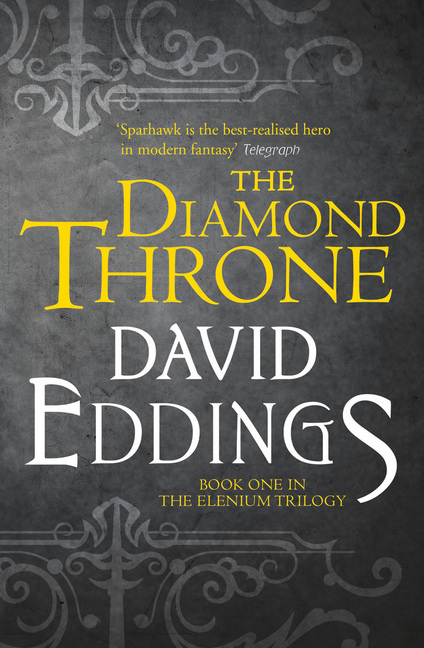 It’s Book 1 of the Elenium, The Diamond Throne by David Eddings! Plot Synopsis: Sparhawk, a Pandion Knight, has returned to his hometown Cimmura after ten years of exile in Rendor.He finds his Queen and former pupil, Ehlana, has fallen ill. Plot: The plot is quite good, and while it does have a fairly standard premise the way that David Eddings handles it is quite interesting, in addition this book is most certainly not for children as the various characters are very free with their violence. It’s refreshing to see that in a David Eddings book. Characters: Sparhawk is pretty much what we think of when we think Knight Templar, ruthless and brutal while still being a generally good person. Talen, Kurik and Ulath are probably some of my favorite characters in this book, but the entire cast is quite good. Flute is also fairly interesting. Overall: This is a great read and probably a must read if you are into any sort of fantasy setting. For those who like: Great Plot, Amazing Characters, Excellent World, Fantasy, Casual Violence.